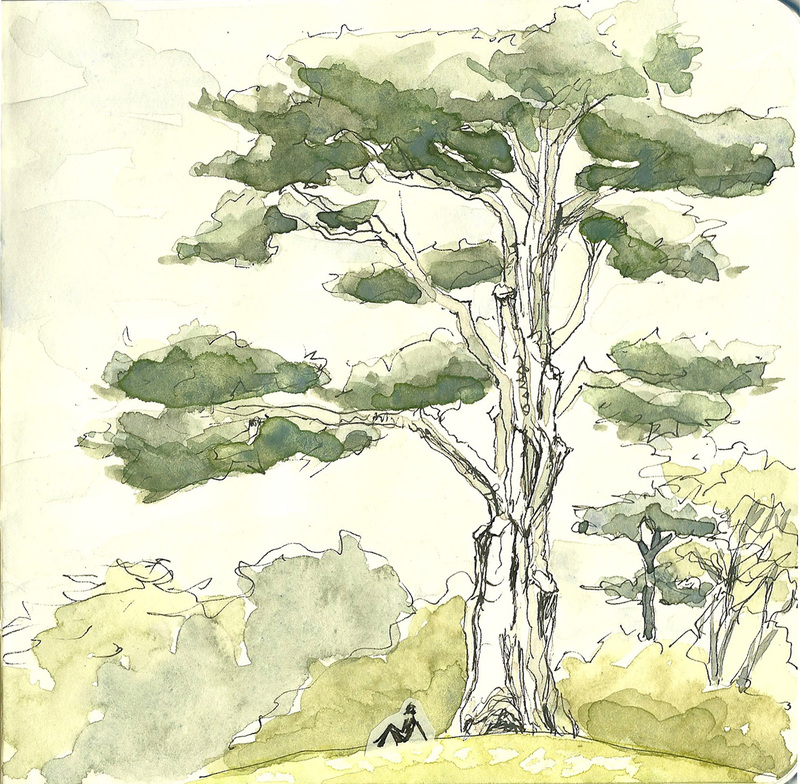 If there is one iconic tree in Golden Gate Park, I think it would have to be the magnificent Monterey Cypress that stands by itself on a small knoll in the great oval lawn just inside the main gate of the Botanical Garden. This specimen has grown to an impressive height with a gorgeous, spiky, horizontal branching pattern and the dark green, clumping foliage so characteristic of the species. The Monterey Cypress (Cupressus macrocarpa) is native to only two small groves on the Monterey peninsula, the larger grove extending about two miles north from Pebble Beach and the other at Point Lobos to the south. But these trees adapt beautifully to foggy, coastal, wind-exposed locations and are widely planted throughout California, especially along the coast. 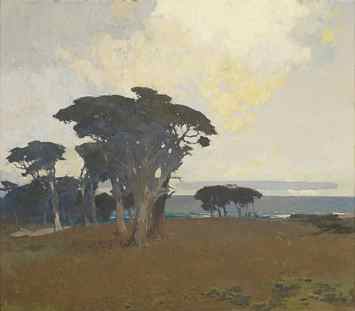 “Monterey Bay,” Arthur Mathews (1860-1945), n.d. Knew the ocean was my need. Language as it blew me down. The thews are thickened to be staunch. Writ between repose and rage. The sea is in my tortured grace. This entry was posted in plants, trees/urban forest. Bookmark the permalink. There are so many beautiful big old trees in the park … and so many starting to come down … but I would have to agree that the location of this one makes it stand out. The Monterey cypresses are amazing for the varieties of their size and shape, depending on how battered by wind, etc. I used to love the dense stand out by Lands End. Some are still there, of course, but were thinned out as the area was made more “visitor friendly” … Love your sketches!